WOLVES HAVE ANNOUNCED that they have reached an €18 million (£16m/$20m) agreement with Sporting CP for the transfer of Rui Patricio. The Portugal international goalkeeper cancelled his deal with Sporting in the summer after an attack by some of the club’s supporters following their failure to qualify for the Champions League. Patricio would go on to join Wolves on a free transfer, which did not go over well with Sporting. The Portuguese side complained to Fifa over the situation, demanding €58.7 million (£51.8m/$65.5m) in compensation from Wolves. But the two sides have now reached an agreement on a much smaller fee, with the Premier League side now considering the matter closed. 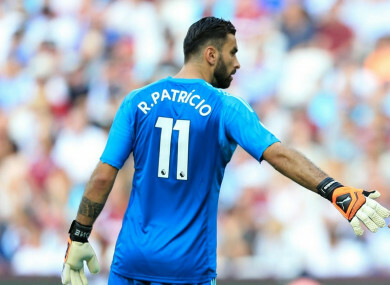 “Wolves have reached an agreement that will see Sporting Clube de Portugal receive a fee of €18m for the transfer of goalkeeper Rui Patricio,” Wolves said on their official website. Patricio has been a mainstay for Wolves this season, starting all 10 of the club’s Premier League matches. Wolves are currently in 10th place in the league, and will take on Tottenham in their next match on Saturday. Email “Wolves reach €18 million agreement for Portugal's number one”. Feedback on “Wolves reach €18 million agreement for Portugal's number one”.